Here you can find a list of ictgames resources designed to aid teachers' delivery during whole-class teaching, less game-led, rather more, tools for demonstration. Model subtraction in a way where you can see the removed amount. Watch a video clip about this resource, (link to YouTube). A useful resource for the daily routine. Choose the date and the weather. 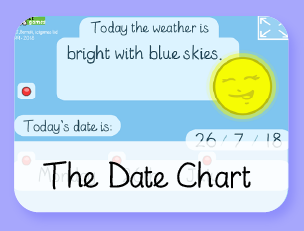 Displays a variety of colloquial terms for the weather, aimed at expanding children's descriptive vocabulary. 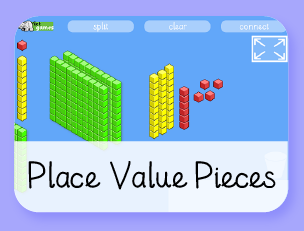 A place value presentation tool. Split and re-combine groups of tens and units. A good way to model decomposition of numbers. 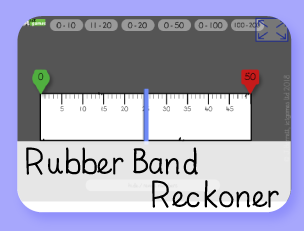 A place value demonstration tool. Great for counting in 100s, 10s or 1s! You can hide/reveal the arrow cards and the Deinnes blocks. 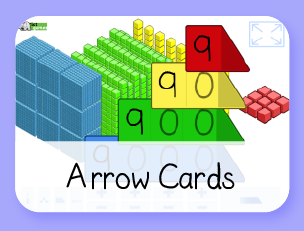 You can partition the whole set of arrow cards or just one card. Try starting and 50 and counting backwards in 1s, many children find this very challenging at the next multiple of 10. 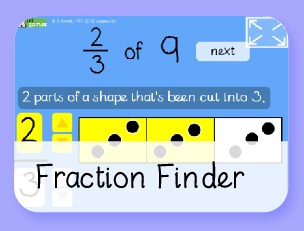 A counting and place value demonstration tool. Great for counting in 100s, 10s or 1s! 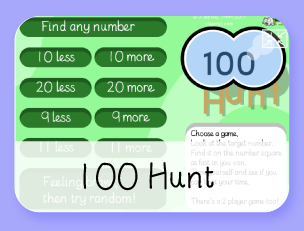 You can 'tick' to see every flip, press '+' in the hundreds column and the game will count in 1's up to 100. 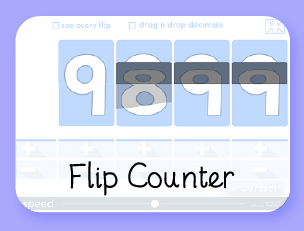 There's a 'flip speed' slider so that you can control how fast the game counts. There's a dragable decimal point for KS2 teachers. Try starting and 100 and counting backwards in 1s, many children find this very challenging at the next multiple of 10. A very simple number ordering activity. Children use a piece of card and and an elastic band to demonstrate their thinking. If the card starts at 0 and ends at 50, where is 75? WEDYK? : What else do you know? You can reveal the exact position once you've described your thinking. 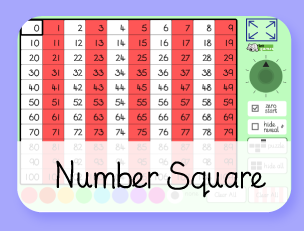 Although this activity does have a strong game element it is useful for demonstrating patterns on the number square and one technique for adding / subtracting 1, 10, 9 or 11. Move forwards and backwards in units of 1min, 5mins etc. Isolate just one clock hand to aid explanation. Hide and reveal hands so that you can challenge children to show you first on their clocks. 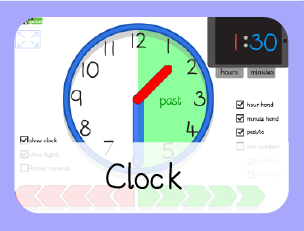 Use colour-coded hands and the corresponding colour-coded digital clock to introduce the digital format. KS2 teacher can select Roman Numerals. Place a whole 1 brick on the stage first, then add another above it pressing to reveal it as fractions of the whole. 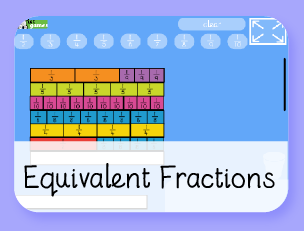 Great for comparing equivalent fractions. e.g. What's ⅓ of 12? "⅓ is one part of an amount that's been cut into 3." Now draw a rectangle, cut into 3 pieces. 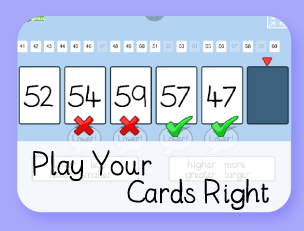 Then use on-screen counters to share 12 between three boxes. Model use of coins without the hassle and confusion of holding so many in your hands. Demonstrate equivalent coins for the same value. 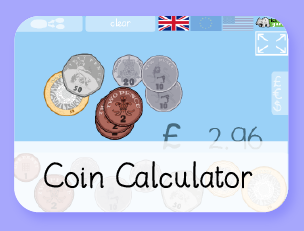 Drag coins onto the stage then split or re-combine coins. 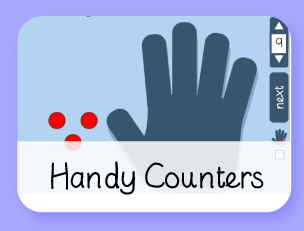 Hide/reveal the total whilst children work it out on their drywipe boards. Includes Sterling, Dollars and Euros. 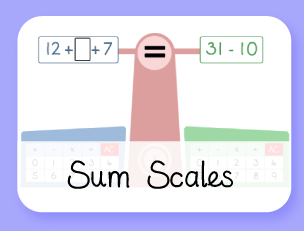 This game uses The Bar Model as an informal calculation strategy to illustrate subtraction as difference. Work out the difference between how much the yellow flies collected and how much the green flies collected. Model the meaning of the equals sign. Make an expression on each side of the scales. Tests to see if each expression is equal. Includes a missing number tool. Model the meaning of the =, < and > signs. 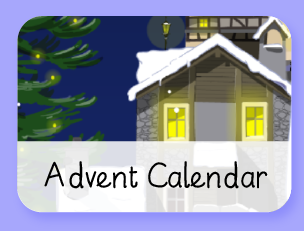 5 Christmas themed Maths and Music games. There are 24 windows in the little village. They're not numbered so that you can return to favourite games. Chimneypot Pressies: -identify odd and even numbers. Fireplace Facts: -practise number facts for 10, 20 and 100. 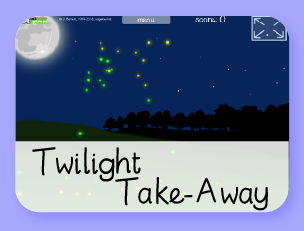 Musical Icicles: -play Christmas songs using the icicles. Bobbing Robins: -the robins sing Christmas songs. Snowman Sums: +/- mastery with part-part-whole. Model The Commutative Law in multiplication. Multiplication can be done in any order. 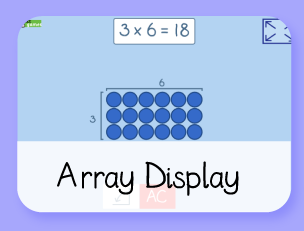 Use arrays to become familiar with the meaning of multiplication. Count the number of 'times' by clicking on each column in the array. A fun lesson starter encouraging children to describe their reasoning, using words for 'higher' and 'lower'. How many days in each month? 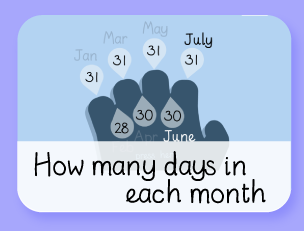 An easy way to remember how many days there are in each month. Want to have something educational up your sleeve for those moments when you still have 10 minutes left and you've finished everything you'd planned? 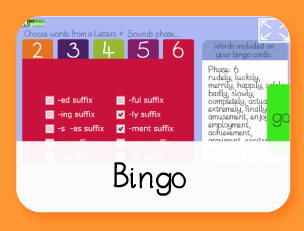 This bingo activity lets you print bingo cards and play with exactly the sounds that you've been working on. 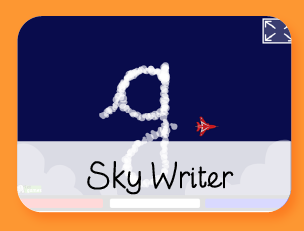 An aeroplane-themed handwriting demonstration tool. You can change the colour of the smoke mid-flight! 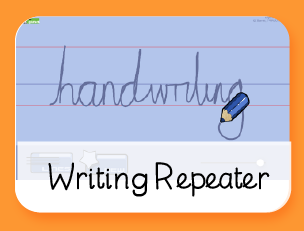 Re-plays your on-screen handwriting. Write a word and re-play it continuously. The best thing is your hand doesn't get in the way when the children are trying to learn! Why not prop-up your class tablets and let a different groups of children practise different words? 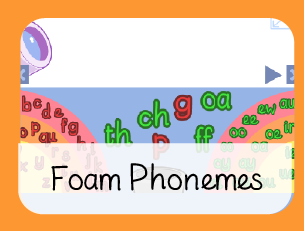 An online version of the Letters & Sounds phonics game. 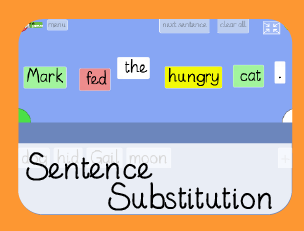 You can also enter and enhance your own sentences. Great for up-levelling a sentence and modelling the thought process as you improve it. A great way to introduce new vocabulary before starting a piece of writing. 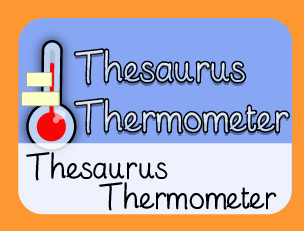 Choose up to four root words and sort their synonyms on a thermometer. Great for the 'Full Circle Game', (Letters & Sounds). Choose approx 10 sounds that you're going to need, (rotate the right-hand rainbow to see more). Arrange the foam letters to make that word. Prints on A4 14 labels. 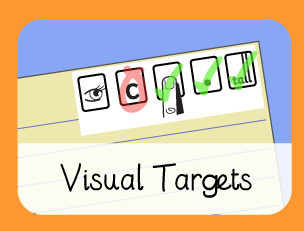 Choose targets for today's writing, then print off and glue into books. A great teacher time saver. Speeds up marking and shares expectations.